Israel is dealing with thousands of children born in the last few years who only know of life with daily Red Color alarms. Having lived through just one this past Tuesday, I can attest to how terrifying a situation this is. Nobody should ever have to live under these conditions. If you want, feel free to put this on your website. Southern Israel has been under attack for the last 8 years. In the first six months of 2006 after Israel withdrew completely from Gaza, there were 500 Qassam rocket attacks on the city of Sderot, Israel. 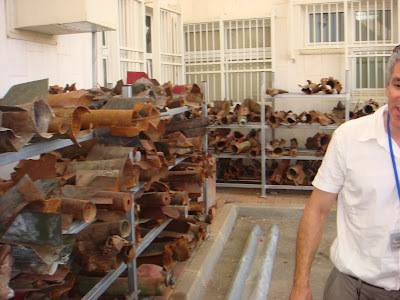 The city then started collecting the spent rockets and has them stashed out back of the Sderot police station.